" Swansea - 2 - Llanllwni "
Date & start time: Saturday 23th March, 2019. 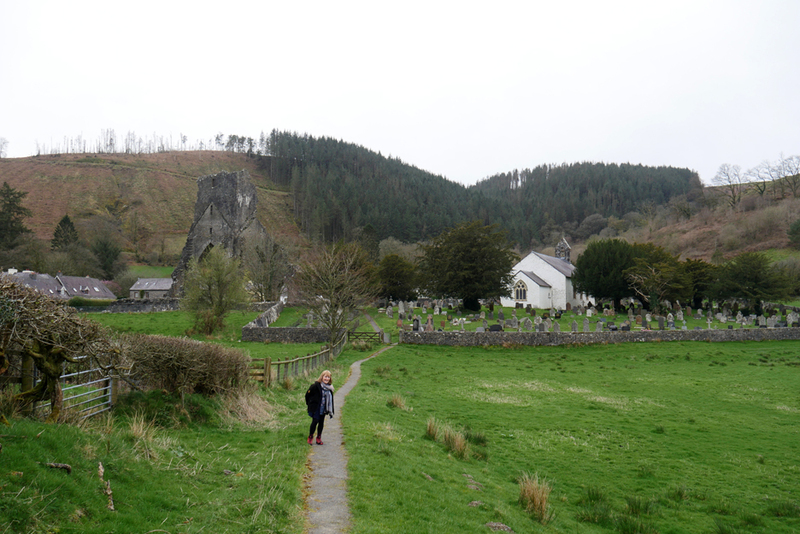 Places visited : A drive around southern mid-Wales, Carmarthen, Llanllwni, Talley and back. 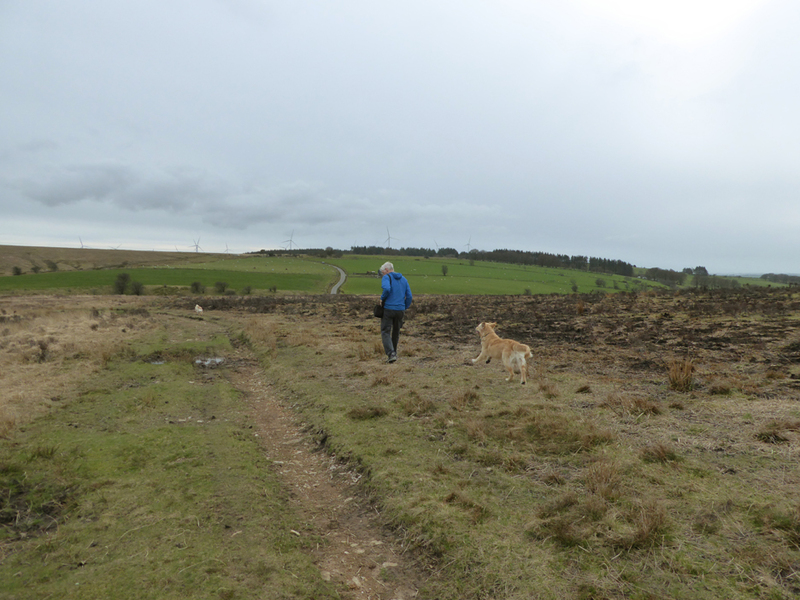 Walk details : Short, local walks to stretch the legs and exercise the dogs. Highest point : Meeting long lost friends. Walked with : Jeff and Gill, Ann and our dogs Dylan and Dougal. 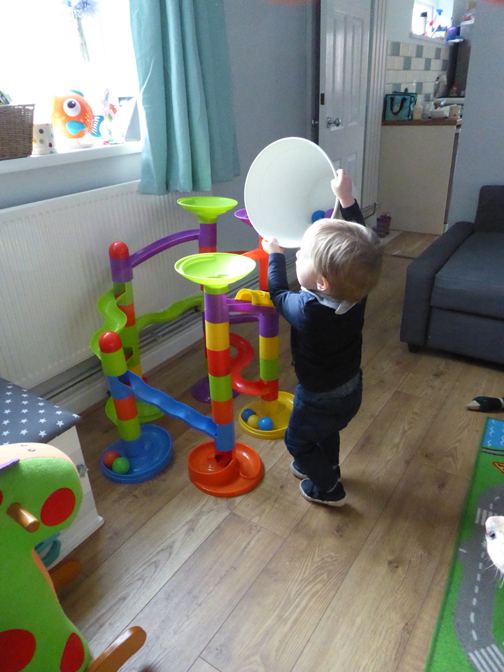 It's Saturday and the weather is sunny, and Luke is playing with his toys in the play room. 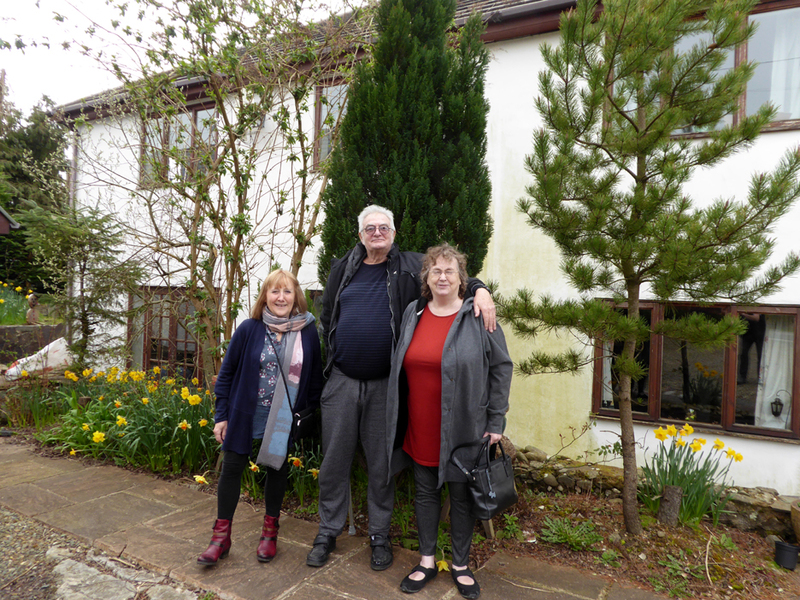 so we take the opportunity to drive into mid-Wales to visit friends we have not seen for many years. At home, Ann and I have a small marble run left over from when Gareth was a child. His son has a new one, larger and more suited to his age group. 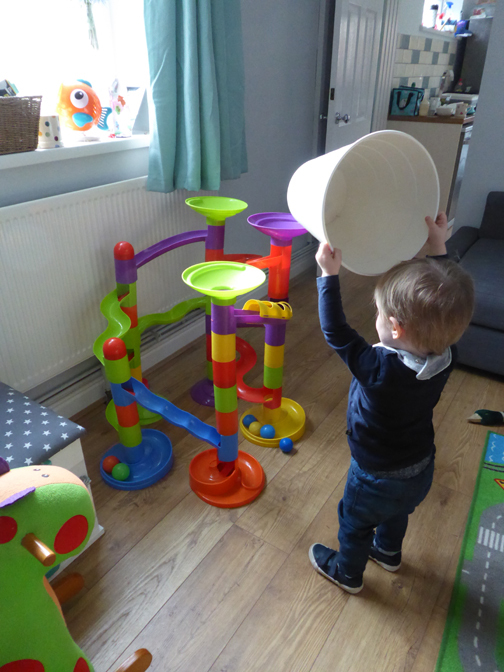 Build the towers and plan the ball runs, drop the ball in the top funnel and see if it makes it to the bottom. If the pace of life is too slow, put all the balls in a waste paper basket and pour them en-mass. I can hear them but I can't see them ? Be careful the basket doesn't fall on your head or you'll miss the fun. 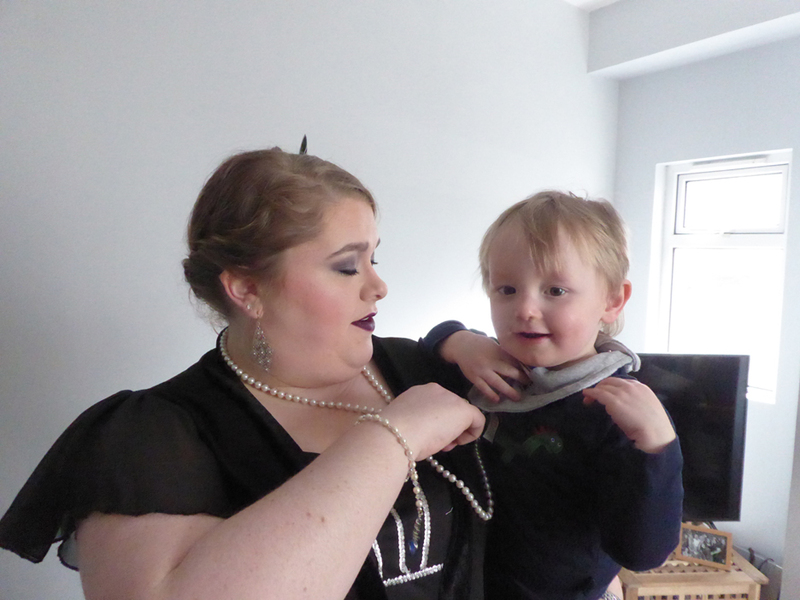 Gareth and Rhian prepare to go out for their event. 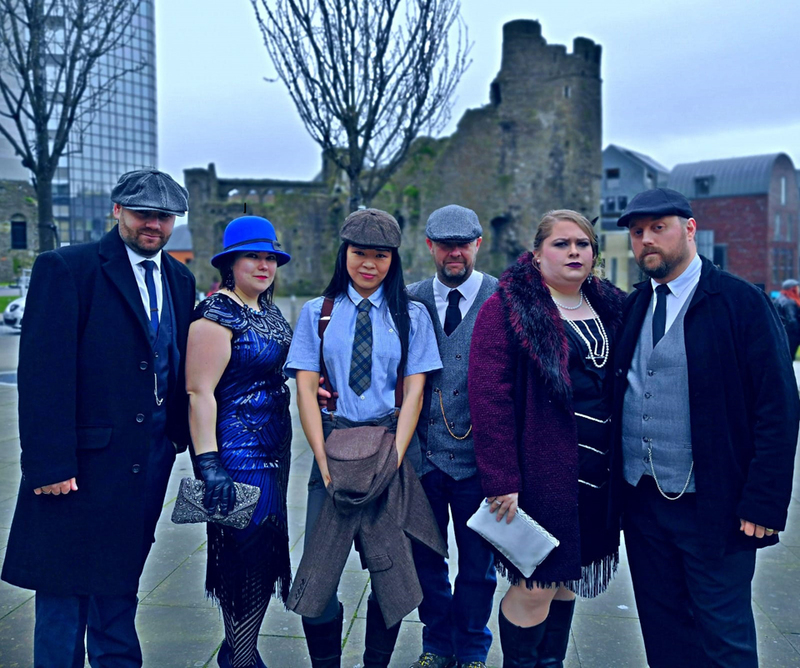 CluedUpp’s award-winning phone app, the outdoor detective experience, will see multiple teams of up to six players competing to unveil the mystery murderer. The event is a cross between Cluedo and Pokémon Go and involves using your mobile to solve clues found around town. 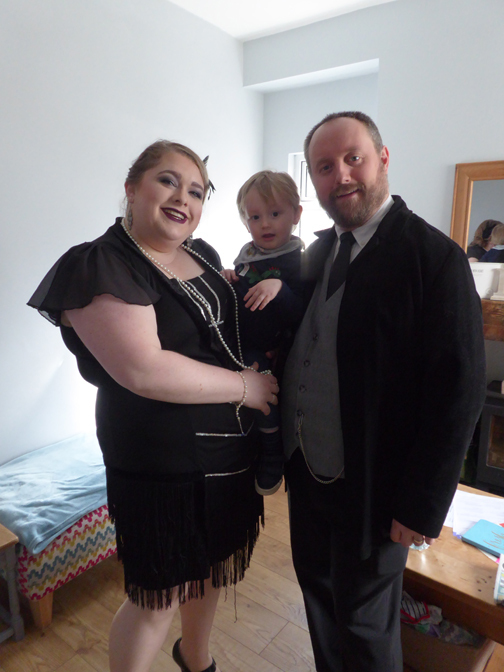 Peaky Blinders inspired 1920's fancy dress is optional but good fun. but by having the "Best Group photo of the Day" . . . a moody photo in front of Swansea Castle. so we have to decide what to do next . . . Instead of staying in Ammanford . 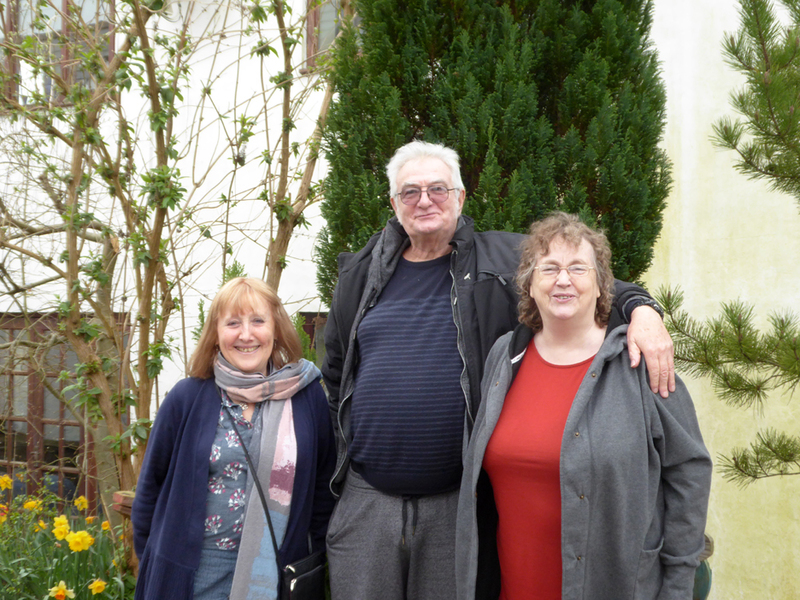 . . we're set off to see friends Jeff and Gill. 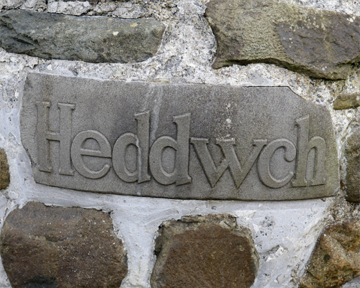 They've moved from Ogmore on the coast to Llanllwni in mid-Wales, on the Carmarthen to Lampeter Road. Ann's teenage friends may have changed a bit since we last met . . . but then we have too ! we took our leave of Jeff and Gill and headed back to find our family once again. On the way home we took the "scenic" route towards Ammanford . . . over the hills. 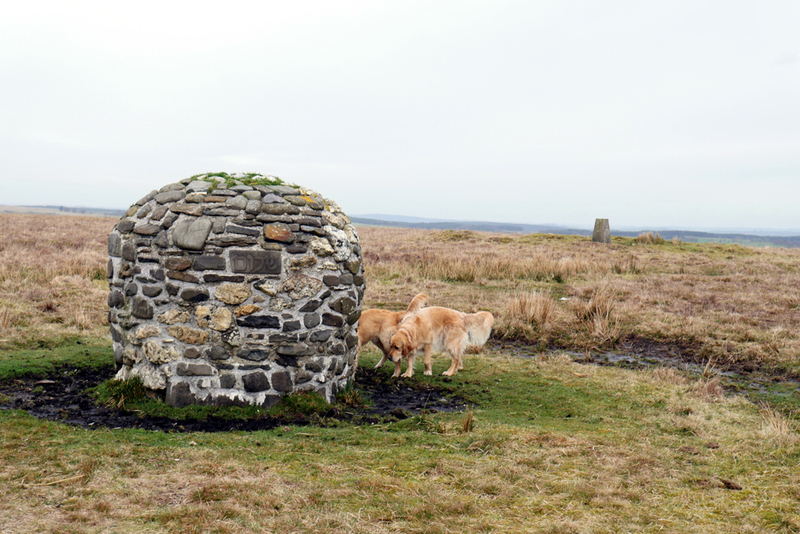 where we stopped near the summit of Mynydd Llanllwni in order to give the dogs a chance to stretch their legs. 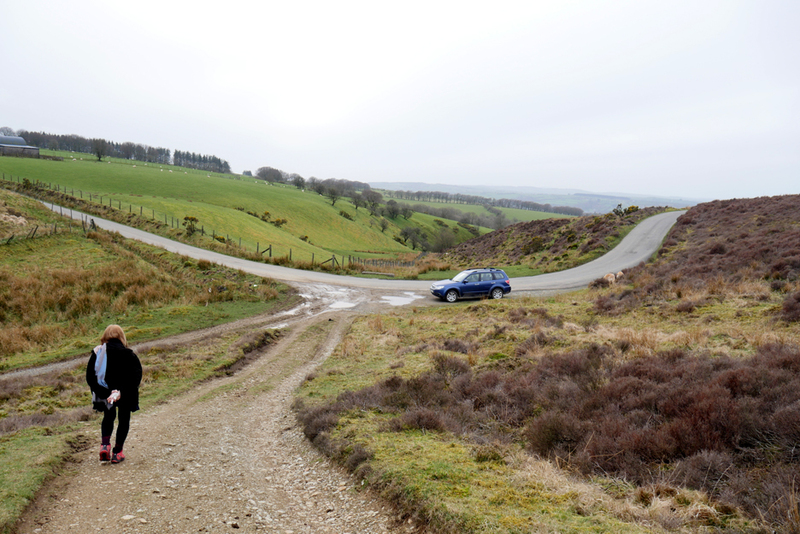 Not really dressed for miles of moorland walking, we returned to the car after viewing the distant summit. 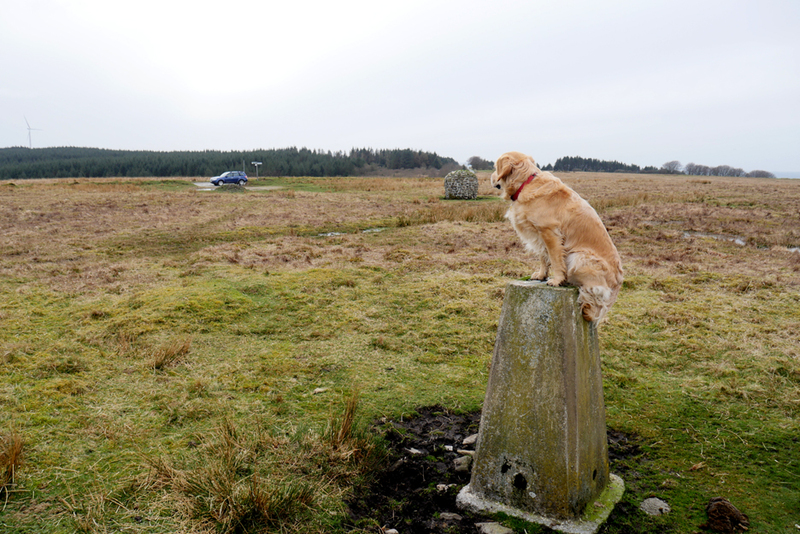 which found Dylan sitting on top of the local trig point . . . no chance looking this way for the photo I suppose ? perhaps a subtle indication of which part of the world the originators were concerned about. Apparently inside the cairn the local school children have placed a time capsule of local memorabilia. 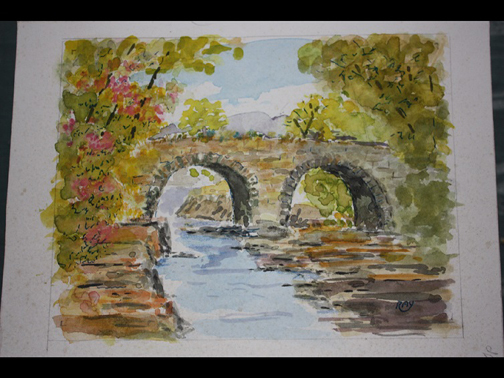 The bridge at Abergorlech . . . where a large tree has washed up in the first span, but what was more amazing was the shape of the second arch. An unnoticed shift in the scaffolding during construction must have caused a deformation which has been incorporated in the final structure. Still, it has stood the test of time so that can't be too bad. 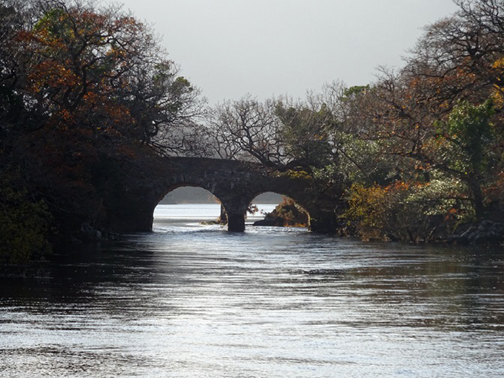 The Old Weir Bridge and Meeting of the Waters in Killarney National Park. 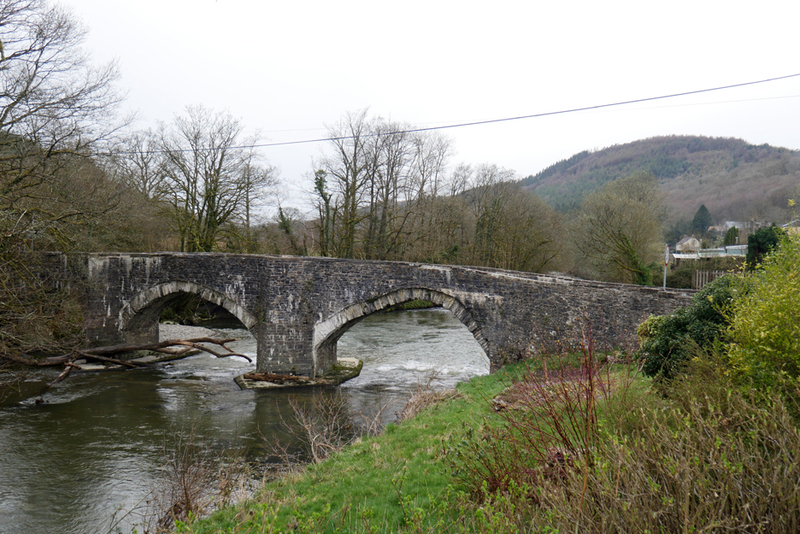 Your bridge picture from Wales was interesting and made me smile. I don’t think we can blame the scaffolding on this Irish one though. It was much more likely to be too much Guinness! My dad tried to capture this in the sketch, but obviously didn’t drink enough of the brown stuff himself . I think you enjoyed catching up with little Luke and family. 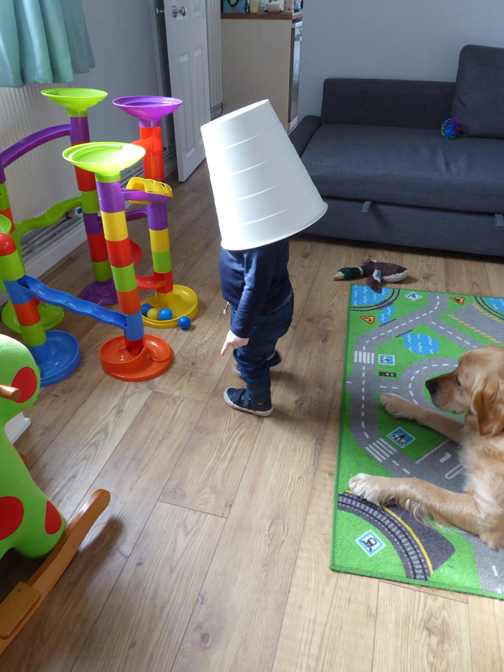 Great pictures and who knows, a new house may bring a new playmate for him. 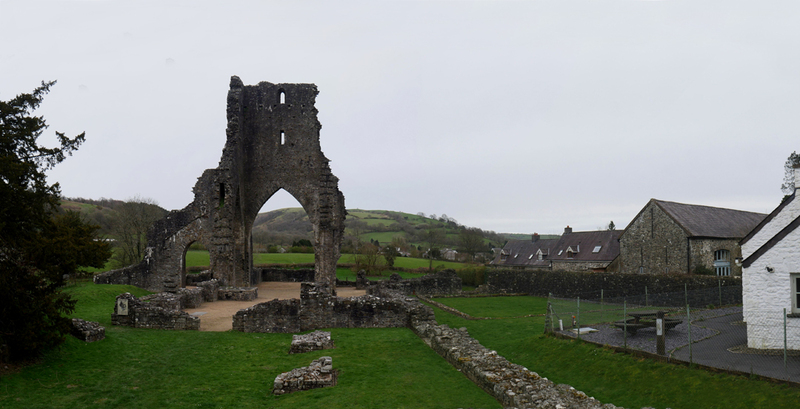 As we turn south and leave the Cothi Valley we pass through the village of Talley, famous for its ruined abbey initially constructed in the 1180's. It had a turbulent existence and was never actually completed to the original plan as the western knave and north isle were never built. 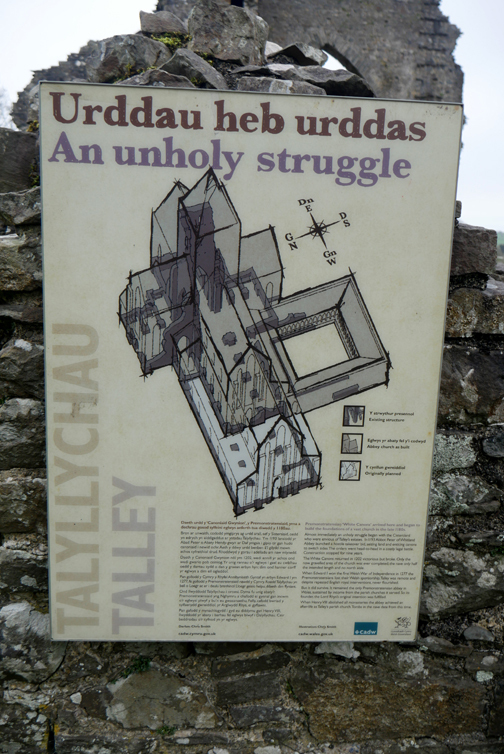 Like so many monasteries, it suffered at the hands of Henry V111 and was laid waste in around 1540.
is enlarged here for your benefit. 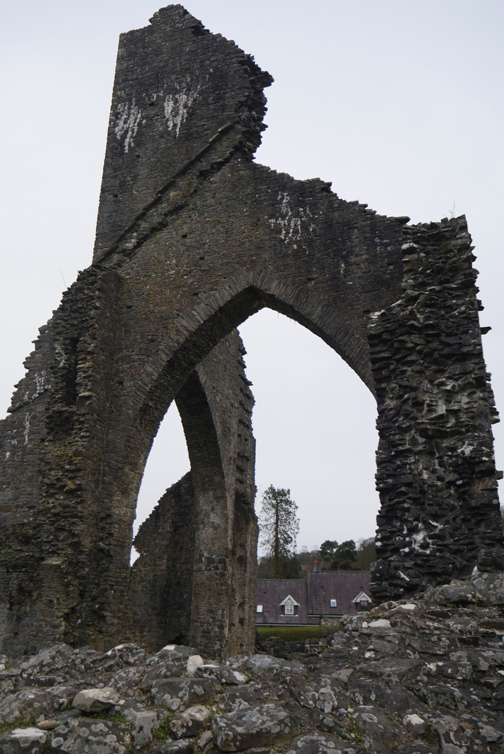 which apparently includes tombs dating from the time of the Abbey's destruction. 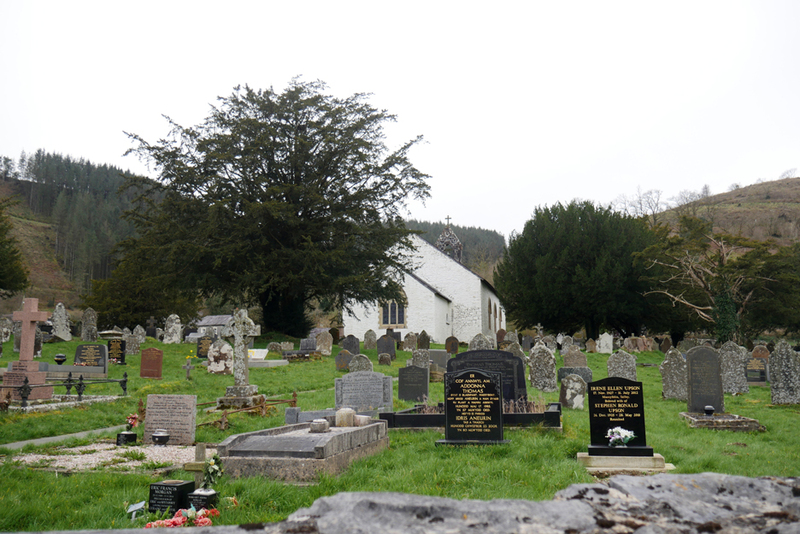 Beyond the graveyard of the Church are the two tranquil Talley lakes. Chance to walk down towards the first lake and to look back at the village and the modern layout of the Abbey site. and farming is still important in the area to this day. the main tower has just about stood the test of time. could not totally destroy the work of the craftsmen. as the village grew over time. 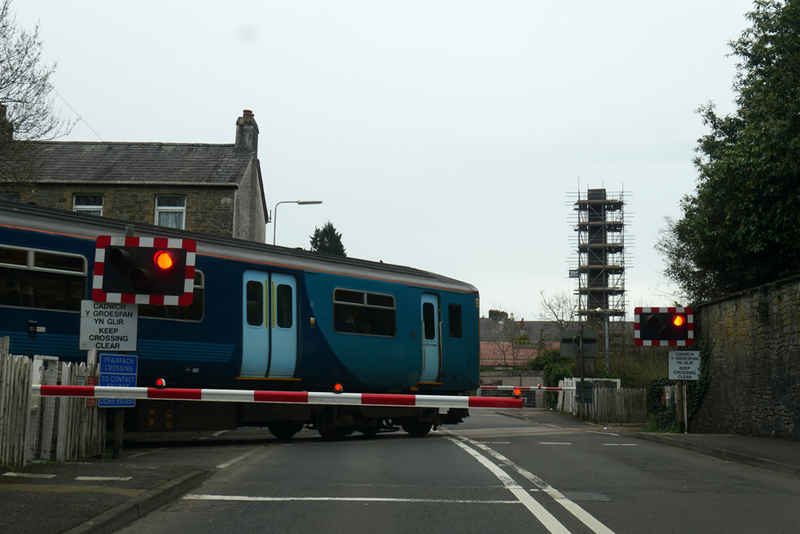 as a two-carriage diesel train on the Central Wales / Heart of Wales line passes through the village of Fairfach. 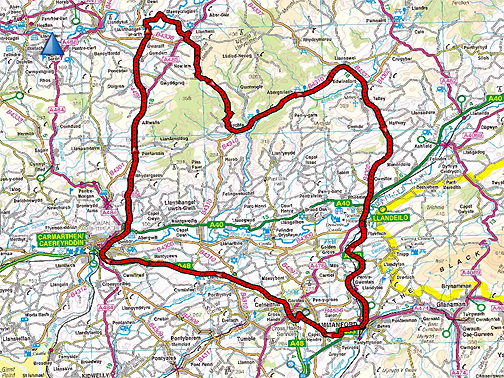 a journey which rivals the Settle Carlisle in scenic beauty if not altitude. 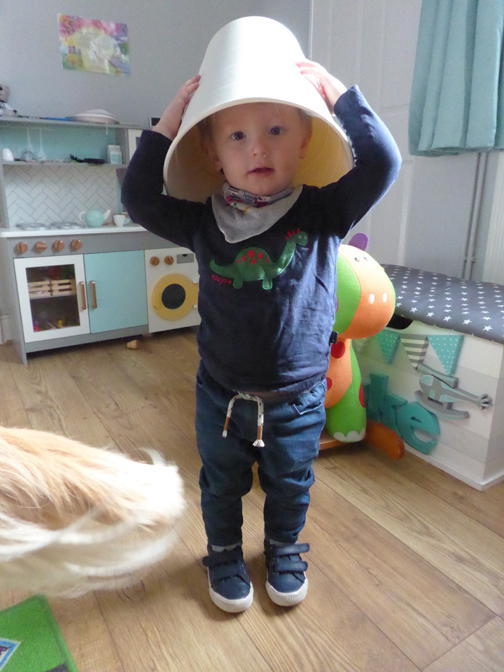 Tomorrow we plan another visit to a sandy beach, this time with grandson Luke and family, rather than with friends. We hope to visit Llansteffan where the River Tywi flows into Carmarthen Bay. 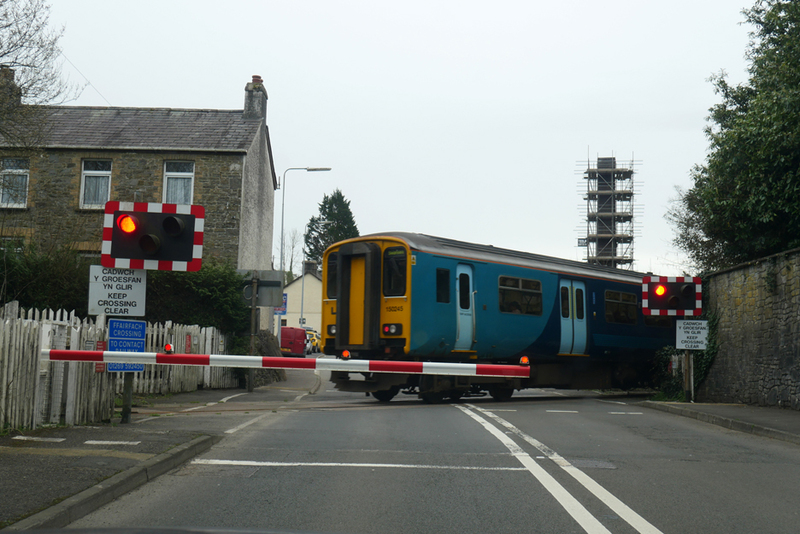 The railway line is actually called the Heart of Wales Line, & it’s a surprise to see two carriages – there’s usually only one! A long-distance footpath linked to the railway has just been officially opened – I don’t know how to do links, but they’ve got a Facebook page with coverage of the recent launch. 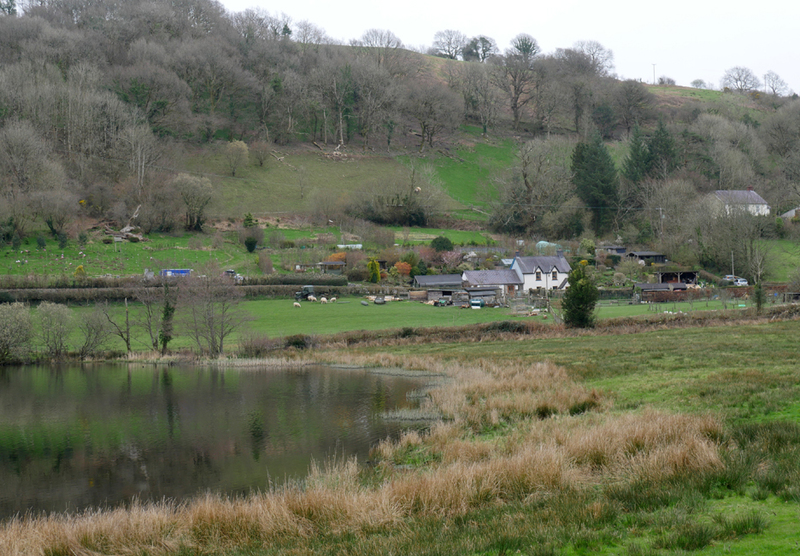 The area near Brechfa looks interesting, but it had me confused for a moment because there’s a Brechfa Pool not far from Brecon; there seems to be a lot of duplication of names in Wales, far more than in England. I wonder whether anyone’s come up with a reason? Regards, Elaine B.
Hi Elaine, I think a name change has occurred in recent years in line with the promotion of this fine rail journey. Sorry no translation of Brechfa for you though 'Brech' is sometimes associated with spots and infection. 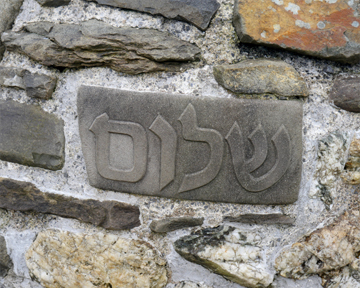 Maybe Brechfa was the home of medical person ? Once you've found a good name then why not use it a few times instead of having to create new ones ! Cheers RmH. This site best viewed with . 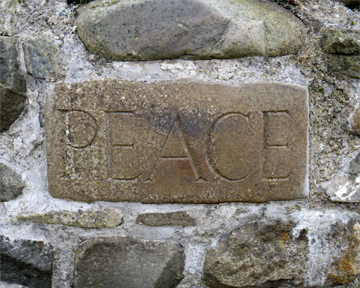 . . an up-to-date address for old friends.